Greening imagination is a systemic process that needs to nurturing in classes and communities. The best hope for learning to live in more sustainable ways lies in new ways of learning about human ecology and the environment across the curriculum. The experience of the natural world; learning how nature sustains life; nurturing healthy communities; recognizing implications of the ways we feed and provide for ourselves; and knowing well the places where we live, work, learn and play are essential to becoming eco-literate. Teachers are in a prime position to connect culture of place with a sense of purpose in the work of their students. NEXT.cc introduces journeys, transdisciplinary activities and measures to green existing school curriculum, campuses, and communities. NEXT.cc supports teachers and students with age-appropriate learning opportunities based on State and Federal Learning Standards including the National Research Council National Science Education Standards, North American Association for Environmental Education Guidelines for Excellence, Common Core State Standards and Federal programs such as No Child Left Behind and No Child Left Inside. Green Imagination Workshops embed systems thinking in scales of investigation. Participants learn directed, supportive and collaborative inquiry-based design strategies for working with diverse audiences. All ages mix physical and digital exploration of the wonder and workings of the built and natural worlds while creating place-based projects.Green Imagination Workshops* are held at diverse institutions of learning- schools, museums, libraries, museums and centers introducing 21st Century Classroom Design, Green School strategies, Outdoor Nature Classrooms, and design of Makerspaces across the campus. We collaborate individually with each new community to tune green initiatives with their specific needs and desires that will motivate and move individuals and organizations to a higher habit of mind. NEXT.cc posts a calendar of scheduled workshops, photos and short videos below. NEXT.cc’s Green Cities Green Schools Workshops for Science, Art, and Math teachers offer an introduction to smart growth guidelines and sustainable development practices that can support their teaching and school and community project based learning opportunities. Study of systems connections of material processes and energy exchanges create an atmosphere of purposeful conversation and reflection about complex environmental issues facing society. Participants leave equipped with resources for a ten-step assessment (water, energy, food, air quality, paper, cleaning, lighting) of their schools, campuses, and communities. NEXT.cc offers a 21st Century Urban Primer for Greening Homes, Schools, and Cities. 6th Grade Chicago Public School girls place sustainable farmhouses, develop self-sufficient Main Streets, and densify their cities taking the roles of Mayors, Health and Well-being Directors, School Superintendents, Parks and Recreation Planners, Transportation Engineers, Housing Directors, Business and Commercial developers. Build a brighter future! 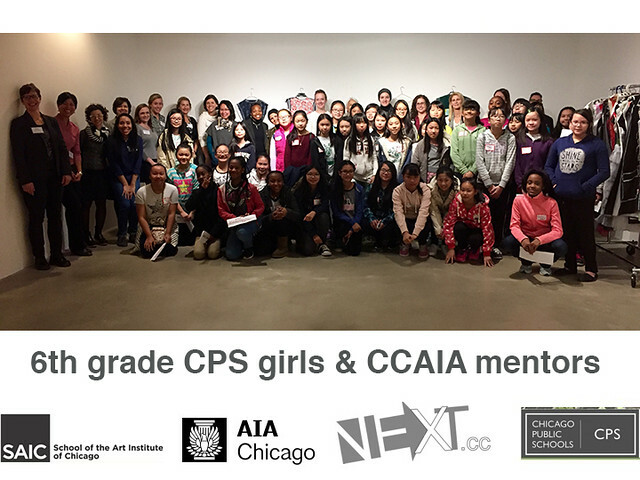 In 2016 Chicago Public 6th Grade girls are given access to NEXT.cc’s Designopedia to imagine cities of the future. As a 21st Century urban primer, NEXT.cc introduces sustainable systems as ways to connect the ecology of place with people. Girls are charged with thinking about providing clean water, local food and renewable energy in the creation of walkable mixed-use, mixed income neighborhoods. Girls create cities of the future and envision their role as urban stewards. Are you interested in bringing sustainable practices to your school? Look at our Green Schools journey and Outdoor Classrooms journey. Our relationship with nature and the big outdoors has changed radically in the last one hundred years. Even more pertinent to the change from the walk to school is busing. Almost 50% of the K12 population is bussed to school. Imagine going from the interior of a home to the interior of a bus to the interior of a school with only thirty minutes to eat lunch, socialize and run on an asphalt play yard before returning to school, bus and home. Recess is now a place to ‘let off steam’ before returning to learning in a desk in a classroom. Also, a recent NPR program stated that middle school children spend an average of only 15 minutes a week in unstructured outdoor activity. Outdoor environments provide a critical opportunity to address contemporary challenges. The Green School Yard Project is a collaboration between garden educators and architects to raise awareness, understanding and application of learning opportunities outside. Outdoor environments provide a critical opportunity to connect with National Environmental Education Standards and ‘leave no child inside’. The Green School Yard Project shares research and best practices from environmentally and place-based project learning schools that connect young imaginations on a daily basis with the big outdoors. The Green School Yard Project offers professional development for school boards and teachers in connecting curriculum to outdoor activities. Research has shown that teachers that are actively engaged in choosing curriculum to take place outside or more likely to continue to teach outside on a regular basis. The Green School Yard Project shares research from Sharon Danks, author of Asphalt to Eco Systems; Eric Nelson, Cultivating Outdoor Classrooms, The Outdoor Classroom Project; Sharon G. Solomon, American Playgrounds, Cultivating Community Space; and Roy Diblik, Small Perennial Gardens, Know Maintenance Approach; Richard Louv, The Nature Principle; and Linda Keane, co-founder and director of NEXT.cc, an environmental stewardship place based project curriculum. It offers collaboration between K12 educators, garden educators, environmental designers, landscape architects and architects to raise awareness, understanding and application of learning opportunities outside. The Green School Yard Project initiated a series of national webinars to transform school design with outdoor learning in outdoor places on school grounds. The Green School Yard Project offers design of + outdoor learning environments + teacher education and activities + children education and activities + free access to place-based project learning. Professional development for teachers introduces changes in 21st-century teaching, opportunities for engaging diverse learner types, and place-based project learning that moves teacher directed teaching to teacher facilitated and student-led inquiry. The Green School Yard Project empowers schools to create outdoor classrooms with multiple activity areas and assists teachers in delivering curriculum outdoors. Based on research on restoring outdoor classrooms and nature play areas on school campuses, NEXT.cc staff work with school districts to return asphalt playgrounds into site specific playscapes. National Webinars including Learning Landscapes Part I, with Eric Nelson and Learning Landscapes Part II, with Sharon Gamson Danks introduce design strategies for reimagining asphalt playgrounds into active community playspaces. NEXT.cc Nature Play Workshop from Linda Keane on Vimeo. Digging deeper into nature’s way, students explore patterns and performance of plants, insects, and animals in learning about biomimicry and its application to innovative designs. From objects, spaces, and even architecture, biomimicry informs today’s forms and material performances. Watch NEXT.cc’s Biomimicry Workshop with 7-12 graders who use the principles of biomimicry to design their advisement spaces, green roofs and collaboration spaces in their new building. Do spaces in your school need refreshing? NEXT.cc’s Sustainability Design Hack series of workshops teams students with architects and engineers to study, analyze and conceptualize options of lighting, sound, and color in your spaces while learning about waves, light, sound, and energy. Choose a single or a series of workshop meetings to learn about conserving energy with passive and active systems. Watch Sustainability Design Hack with Chicago Public School Teens at the YOUmedia in the Public Library. You Media Youth working with Discover Design and NEXT.cc, explored light as a mediator of improving public space. Eight high school teens formed the Student Design Team and experiemented with energy reducing strategies to improve spatial conditions and sustainability. Students used physical and digitalmodeling to study iterative ideas and presented their ideas to the Chicago Building Commissioner. In spring of 2013, the Keanes re-initiated the K12 Architecture and Design Committee of the Association of Collegiate Schools of Architecture. The ACSA, with its academic mission to raise awareness, develop understanding and provide application opportunities for college students in the design fields of architecture, interior architecture and design, landscape architecture and urban planning, needs to reconnect architecture students with the very public that the field(s) deem to serve. The Keanes brought together a panel of architecture schools and architecture programs to re- introduce the subject of place-based design project learning. Linda Keane, AIA, moderated the session.In 2018, NEXT.cc received a National Creative Achievement Award in Education from the Association of Collegiate Schools of Architecture. NEXT.cc’s Design As Nature Teacher Workshops offer a hands-on introduction to what design is, what it does and why it is important to our future economies. Workshops start with an interactive presentation on changes in learning and teaching followed by a two-part project-based session. Participants work on the computer, in the classroom and imagine community-based efforts while taking virtual field trips, accessing interactive programs, and learning about contemporary global practices. Participants observe, analyze, diagram, and quickly experiment with exercises that move fluidly between physical and digital learning. Workshops are centered on themes such as Fashion and Architecture, Envisioning Imagination, Lines Are Everywhere, Design in the City, Spaces, and Places, All About Food, etc. Workshops are individually tuned to fit the need of a school district, museum or library group. Workshops are available in various lengths: 90 minutes, 3 hours, a whole day, or two days. Workshops are available for CPU credits. ## design education **NEXT.cc’s Design Education Institute** facilitates hands-on STEAM by design (math, science, art, engineering) workshops through an environmental design lens. Using place-based design projects, NEXT.cc enhances learning opportunities in school communities. Design Institutes offer a series of scheduled workshops over an agreed upon period to interested constituents that seek a greater grounding in design thinking, design making, and design practice. NEXT.cc offers contemporary methodologies and hands on experience of design activities that teachers can deliver in the classroom. Developed from weekly lectures of SAIC’s Eco Design Class in the Department of Architecture, Interior Architecture, and Designed Objects, Design Institutes are available to administrators, teachers, non-formal educators and community mentors. Participants leave introduced to directed, supported and independent inquiry processes equipped with online access to design curriculum for use across the traditional curriculum in project-based, place-based activities. We desire not to just describe the world of design but to encourage the design of the world conditions to create change. STEM Teaching (Science + Technology + Engineering + Math) supports students with the necessary skills to prepare them for technological career challenges of the 21st century. Teaching design as an active practice, learning from the world, engaging the world and improving the world, transforms STEM objectives into STEAM objectives (Science + Technology + Engineering + Environment + Art + Math). Design education is a socially constructed landscape that connects teachers and students with their immediate communities. Because everything is designed in the classroom, around the school campus, and in the school’s community, students need to encouragement to experience the wonder of their immediate natural and built world. This is an important first step in engaging with a place and creating place-based learning experiences. Placemaking is a design tool that creates a sense of ownership in a public place by attracting and connecting people to a specific location. While space is defined as an area, a place is an attraction and a destination. Without public space, there is no public life. Most cities are defined by their public spaces. Public spaces often symbolize a school, community, a city or an entire society’s identity. Integration of place making design projects allows students to learn from their immediate surroundings and connects them to a specific location at a specific time. Placemaking offers an array of investigative tools - activity and behavior mapping, interviewing, counting and tracking of use as well as environmental mapping. NEXT.cc creates transdisciplinary projects to connect learning standards across traditional subjects with school communities. assist schools and school staff in the planning of place specific design curriculum to assist students in connecting themselves and their friends with the world of design and design of the world. With increased interest in creativity education and the STEM to STEAM movement, NEXT.cc delivers high-energy keynote addresses to set the stage for hands-on conferences. Dynamic examples of project-based learning integrate best practices, neurological research, and transdisciplinary systems thinking, learning and making. Mark and Linda Keane, AIA, NCARB and NEXT.cc staff lead NEXT.cc Workshops. The Keanes, artists, architects and co-creators of NEXT.cc are leaders in design education. Their STUDIO 1032 combines environmental design with architecture in green initiatives along the Milwaukee- Chicago corridor. Bringing design to the public with films and publications, their award winning animations have been shown on PBS and nationally and internationally at conferences, museums and film festivals. Mark is Professor of Architecture at the School of Architecture and Urban Planning at the University of Wisconsin at Milwaukee and Linda is Professor of Architecture and Environmental Design at The School of the Art Institute of Chicago. Together they have over fifty combined years of teaching and curriculum development and sustainable design practice. The Association of Collegiate Schools of Architecture, the American Institute of Architects, the Art Institute of Chicago, the National Endowment for the Arts, the Architects and Design Educators Network, the Public Broadcasting System and the Graham Foundation have recognized their design publications and workshops. In 2009, Mark received the American Institute of Architects Students Teacher of the Year Award. NEXT.cc staff is made up of college students studying design and education fields. Folding, Fanning, Forming & Flying FUN!